Jess and her husband Adam made the move from Grand Forks, North Dakota to Washington state in October of 2016. Even though she had other employment opportunities, Jess decided that DU felt like home and has been a great addition to our pack. 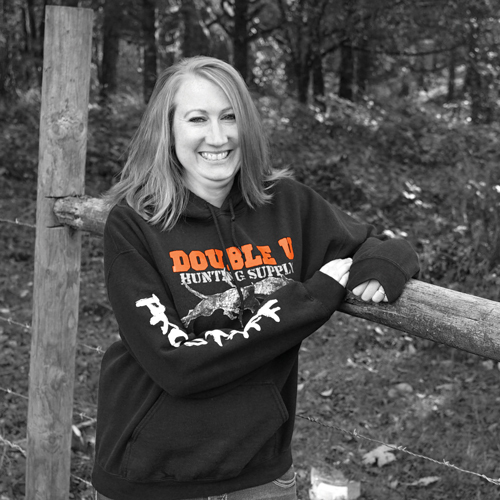 With over 15 years of customer service experience, she is a true professional that takes your hunting as serious as you do. Jess wears many hats around the shop from taking your phone orders, to handling all sponsorship requests from hound clubs nationwide, she has it covered! Jess always has a smiling face on the other end of the line and happy to help in any way she can. Jess enjoys spending time in the outdoors hiking and is a frequent traveler of the Washington and Oregon coast. She enjoys checking out new restaurants in the area and a good cold beer at surrounding micro pubs . (This Prize has been CLAIMED: Clue: Find and order a product called "Brass Tag" It is not our standard Brass Nampates) with First Aid Kit in line 1 to claim the First Aid kit) Not only does Jess have great taste when it comes to food and beer, but she has a great taste in music as well! If there is a good concert in the pacific NW, odds are you will find Jess and her husband somewhere in the crowd. But when she is not running around, Jess does enjoy her time at home. She also enjoys cooking, reading and watching football in her off time.